With EMAs, accuracy is determined by mechanical drive mechanisms in both screw and belt-driven systems, which are definable and calculable. EMAs are less susceptible to the environmental factors that can affect hydraulic and pneumatic systems, such as air temperature and humidity, which can have a notable effect on the precision of movement. Repeatability is the capability of a linear actuator to consistently and accurately achieve the same move. Because the drive elements of the EMAs are comprised of mechanical components, their motion is much more repeatable than hydraulic or pneumatic systems, whose motion and end of travel location can vary according to system pressures and a myriad of other factors. In EMAs, repeatability is a variable of the manufacturing process, tolerances, and specifications of the mechanical drive elements. The ability of these components to be manufactured within known and predictable tolerance levels greatly mitigates the variability of repeatable motion. EMAs offer the ability to tightly control all aspects of a move. Precise travel speeds and acceleration magnitudes can be defined to ensure smooth movements without abrupt stops or “jerking” motions typically seen in pneumatic and hydraulic solutions. This also gives the user the ability to perform complex motion profiles, where speed and accelerations may vary across the required movement length. As noted above, EMAs are much less susceptible to changes in environmental conditions that could result in unpredictable movements in pneumatic and hydraulic solutions. EMAs are also quieter in use, only use power when they are in operation, and do not require the large systems of pumps, compressors, and hoses required by pneumatics and hydraulics. As a result; EMA systems are smaller, are free of hoses that could become a safety hazard, and eliminate the risk of oil or other fluid leaks that could be of detriment to personnel or their surroundings. While EMAs have a higher initial cost than most hydraulic and pneumatic systems; they operate at a significantly higher efficiency, use less energy, and require less maintenance. These benefits result in cost savings that more than offset the higher implementation costs over the service life of the EMA. Selecting the most appropriate EMA design for your linear motion application takes some careful analysis. To help, Hunt Valve Actuator Division has designed a free guide, How to Select the Appropriate Electromechanical Actuator, that can simplify the selection process and get your automation system design off to a good start. 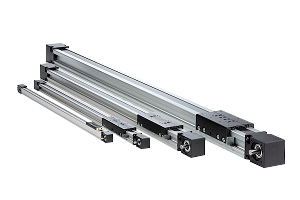 At Hunt we specialize in designing electromechanical linear motion systems for a broad array of applications and requirements. Whether you need an off-the-shelf model or a custom solution, we are happy to work with you to determine the best solution for your unique needs. Contact us or request a quote.